Setting parental controls for your home broadband is the easiest way to filter and restrict inappropriate websites on any device connected to your home wifi. Making sure your children's devices are set up safely will help you to make sure they get the best out of their device. 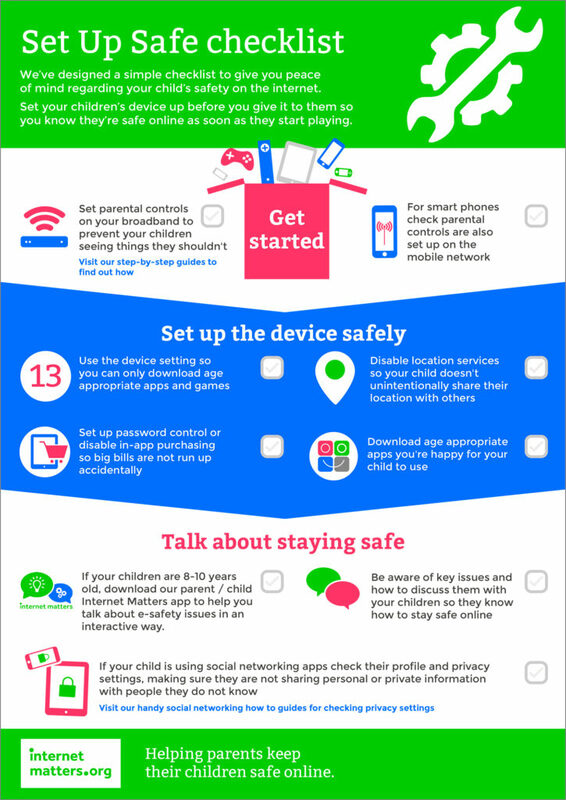 The website www.internetmatters.org has some great advice, simple instructions and helpful tips on just about every device, wifi provider and games console to help you keep your children safe at home. We have added a few of their really helpful guides below but clicking on the link www.internetmatters.org will give you access to all the resources that you need. We really can't rate their site enough! The checklist below, from the website InternetMatters, gives some simple tips to make sure you have a head start.